Pakefield is a southern suburb of Lowestoft, and Lowestoft is home to Suffolk's grandest Catholic church, Our Lady, Star of the Sea. However, like most Catholic churches in Suffolk, Our Lady isn't really big enough any more, so St Nicholas serves as its chapel of ease south of the river. St Nicholas was built by Baines and Baines of London, the same architects as of Star of the Sea. It was built at the same time, and of the same materials, albeit on a much humbler scale. What makes it remarkable, however, is that St Nicholas was not built as a Catholic church at all. 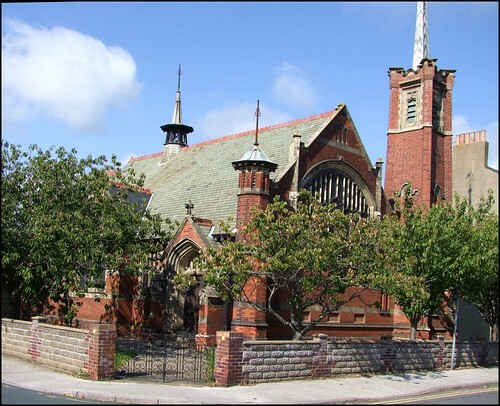 On May 8th, 1902, just a month before Star of the Sea opened for business, the foundation stone was laid here for what was to be South Cliff Congregational church. The benefactor of the site was J. Colman of Norwich, and the church opened in 1903. The building consists of an Early English-style nave in red brick with white bandings, with large Perpendicular windows. An octagonal turret sits on the south-east corner, with a tall, tapering tower and spirelet in the north-east corner. A sanctuary bell-style fleche sits on the nave roof, and small transepts accomodate a vestry and an organ. There is a similarity with the near-contemporary work in Suffolk of the important architect Leonard Stokes, at Sudbury for instance, particularly in its use of banding, a corner tower and a fleche. A hall was added to the west end of the building after the Second World War, and in 1961 the South Cliff community were one of the Congregational churches absorbed into the new United Reformed Church, and this church became Pakefield URC. Unfortunately, the changing denominational climate meant that numbers here rapidly fell, and eventually Pakefield URC closed, the congregation moving in with the one up the road at Kirkley. Clive Brooks, in his excellent history of Lowestoft parish published in the Diocese of East Anglia Yearbook 2000, notes that the building stood empty until 1995, when an approach was made to the trustees by the Catholic Diocese of East Anglia, keen to find a presence in the south Lowestoft area. I was told by a nice old lady who I met in the church that many of the former Congregationalists were not at all happy about the building falling into the hands of what she quaintly called papists, but on August 11th, 1995, an emotional ecumenical service was held in the newly dedicated St Nicholas Catholic church. The transition was marked by a 'Presentation of the Gospels' ceremony, in which Reverend Donald Clarke, the retired former minister of the URC church handed a bible to the Catholic Priest, Father Tony Sketch, signifying the continuance of Christian teaching and worship in this place. The congregation was made up of Catholics and Congregationalists who had been members of the former congregation here, and the ecumenical Churches Together in Lowestoft was also represented. A slate plaque on the east wall commemorates the building's history, a marker of the continuity of this sacred space across the generations, and across the denominations, which I thought was lovely. You step into a cool, slightly dim and predominantly red-brick interior, still retaining much of the simplicity of its Congregationalist days. The nice lady said that she prefered it to Star of the Sea, and I could see her point; here, the Art Nouveau style has been paired down to its essence, and the architecture is not distracting, merely harmonious. The geometric acrobatics of the roof are a contrast, the beams picked out in black on white making them all the more dramatic. St Nicholas retains a feature from the building's time as a Congregational church which is of great significance and importance. I had not known about it, and I do not think that many people will have. This is the plaque which remembers Claud Charles Castleton, who won Lowestoft's only Victoria Cross of the First World War. Actually born an Australian, he was the son of Thomas and Edith Castleton of Wilson Road, Lowestoft, and he was killed in the Battle of the Somme on the 29th of July 1916. The Commonwealth War Graves Commision website notes the report in the London Gazette of 26th September 1916: For most conspicuous bravery. During an attack on the enemy''s trenches the infantry was temporarily driven back by the intense machine gun fire opened by the enemy. Many wounded were left in "No Man''s Land" lying in shell holes. Serjt. Castleton went out twice in face of this intense fire and each time brought in a wounded man on his back. He went out a third time and was bringing in another wounded man when he was himself hit in the back and killed instantly.